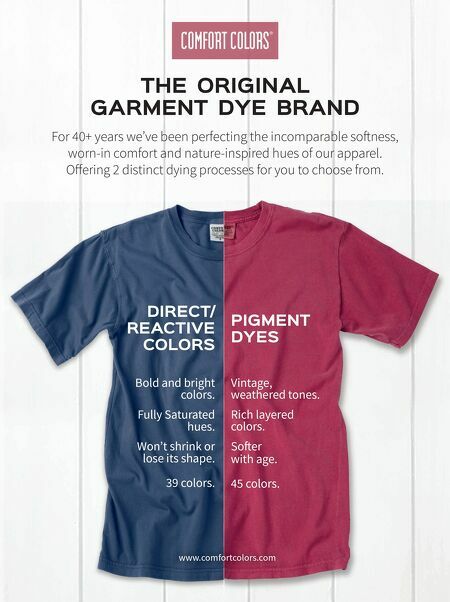 PIGMENT DYES DIRECT/ REACTIVE COLORS THE ORIGINAL GARMENT DYE BRAND Bold and bright colors. Fully Saturated hues. Won't shrink or lose its shape. 39 colors. Vintage, weathered tones. Rich layered colors. So•er with age. 45 colors. www.comfortcolors.com For 40+ years we've been perfecting the incomparable soness, worn-in comfort and nature-inspired hues of our apparel. O•ering 2 distinct dying processes for you to choose from.